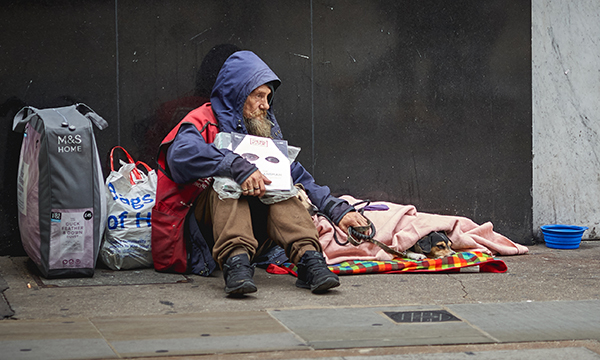 Twenty-two organisations representing nurses and outreach workers have demanded a clear plan and more funding to tackle ‘shocking’ health inequalities among homeless people. Leaders of the groups wrote to NHS England chief executive Simon Stevens reiterating previous calls for at least £30 million to be spent year-on-year on healthcare for homeless people. The letter also calls for additional funding for specialist interventions such as dedicated mental health provision for people on the street and increased access to general practice. NHS staff training to improve attitudes towards patients who are homeless and greater flexibility on health appointments are also needed, according to the letter. Queen’s Nursing Institute chief executive Crystal Oldman is co-signatory to the letter. The institute’s Homeless Health Network comprises more than 800 nurses and allied health professionals working with homeless people. Dr Oldman said: ‘Nurses know that investment in preventive measures and access to services will not only improve, enhance and extend lives but will save the NHS significant sums of money. Other co-signatories to this week's letter include leaders from the homeless charities Shelter and Crisis and the London Network of Nursing and Midwives, which has developed homeless hospital discharge guidance. The government’s Rough Sleeping Strategy 2018 recommended up to £30 million be spent on health services for people who sleep rough over the next five years. But the letter highlights this is a ‘tiny fraction’ of what’s needed, with an estimated £85 million spent on acute services alone for people who are homeless.